Beautiful, healthy teeth for life! Visit Dr. Daniel Zedeker D.D.S. today! 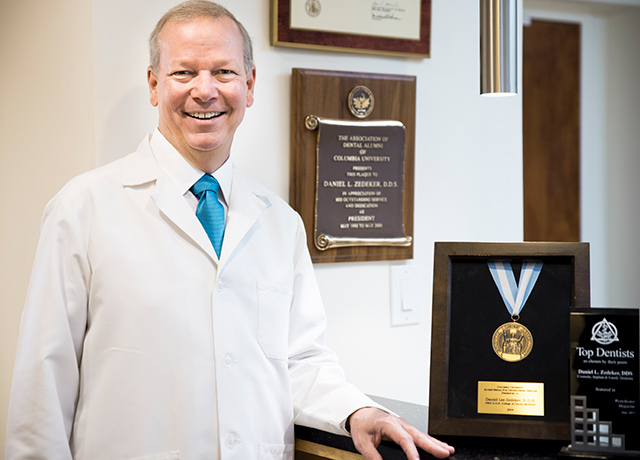 For a beautiful smile call Dr. Daniel Zedeker, a recognized leader in the field of cosmetic dentistry and chosen by his peers as one of the “Top Dentists” in Westchester. A Beautiful Smile reveals a great deal about a person. It’s an important ingredient for success and self-esteem. A nice smile communicates confidence, attractiveness and friendliness. Comfortable Care is provided for all patients before, during and after appointments. A conservative approach is the priority to save teeth first; implants are a last resort. Health & Well-Being are benefits that everyone enjoys from healthy teeth and gums. The mouth is the gateway to good overall health and longevity. Visit Dr. Zedeker at our convenient location in beautiful Dobbs Ferry, NY. Dr. Zedeker’s staff has expertise in electronic processing all types of dental insurance claims and financing. We will work with each patient to insure that the proper treatment plan is presented to their respective insurance company and work with you to maximize your coverage. 24-hour emergency service is available 7 days/week. © 2018 DentistDobbsFerry.com. All rights reserved.